Architect Albert Speer (Mannheim, March 19 1905 - London, September 1, 1981) joined the NSDAP in 193o. Goebbels introduces him to Hitler, who appoints him to his personal architect. In 1937 Hitler tasks him to rebuild the German capital Berlin into Germania, the megalomanic new capital of the Third Reich. Speer becomes minister for armaments and munitions in 1942. As such he's directly responsible for fate of milions of slave labourers from all over occupied Europe. Following his release in 1966, Speer had a career as a writer. 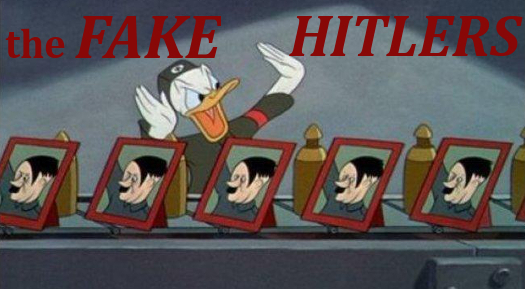 He also was active in Hitler forgeries industry. Speer died of a cerebral hemorrhage in London, where he stayed with his girlfriend in a hotel, preparing for a television interview. Charles Hamilton (1913-1996) was a American handwriting expert and manuscript dealer, and one of the first to declare that the Hitler Diaries were forgeries. For years after this mendacious architect’s release from prison, he sold to American visitors at high prices architectural drawings in pencil that he claimed were made by Hitler. Because of the apparently inexhaustible supply, I suspect that Speer whipped these out in his study while buyers from the States waited in his drawing room." Charles Hamilton. The Hitler Diaries. Fakes that Fooled the World. The University Press of Kentucky, [Lexingon],  [first edition 1991]. Page 131-132. Quotes from Speer on Hitler's sketches, sketchbooks and watercolors, in Inside the Third Reich. Memoirs (1970) . Speer, page 41: "He [Hitler] once showed me his sketchbook of the early twenties. I saw attempts at public buildings in the neobaroque style of Vienna's Ringstrasse-products of the eighteen-nineties. Curiously enough, such architectural sketches often shared the page with sketches of weapons and warships." This is the firtst time Speer mentions the existence of Hitler's sketchbook. Speer, page 50: [Hitler, after the death of architect Troost] "On the trip to Munich he sometimes prepared himself for the role [of being head of a architect studio] by discussing designs or making sketches." Speer, page 74: "Hitler wanted an arch of triumph four hundred feet high. "At least that will be a worthy monument to our dead of the world war. The names of our dead, all 1,800,000 of them, will be chiseled in the granite. " (...) He handed me two sketches drawn on small cards. "I made these drawings ten years ago. I've always saved them, because I never doubted that some day I would build these two edifices. And this is how we will carry it out now." Whether Hitler really made this drawing remains the question. Giesler (page 325/326), quoting Hitler: In Berlin wird sich der Triumphbogen über ein Strassenkreuz wölben, seine Dimensionen, seine kubischen Massen entsprichen den proportionen des Platzes und den weiten Strassenräumen. (...) Aus dem Empfinden heraus skizzierte ich damals diesen Bogen und darin die Gloriole unter den hohen, wuchtigen und schwerlastigen Gewölbe. Diese Gloriole dient sowohl als Kontrast zur Masse alsauch zur úbermittling des Massstabs." 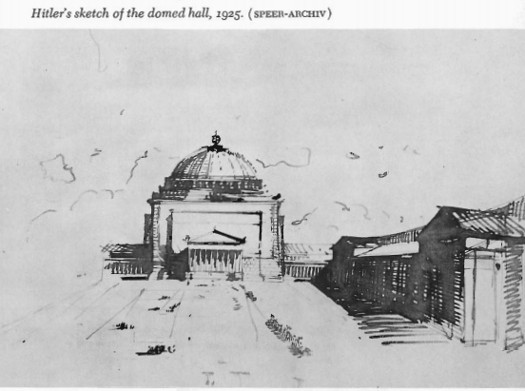 This sketch might be authentic - as the existence of such a sketch is also mentioned by Giesler, Speer's rival architect. In Price: 525. Speer, page 80: "I think, [Hitler's] sense of political mission and his passion for architecture were always inseparable. It seems to me that this theory is borne out by the two sketches he made around 1925, when at the age of thirty-six his political career had been virtually wrecked— for certainly it must then have seemed a wild absurdity that he would ever be a political leader who could crown his success with a triumphal arch and a domed hall." 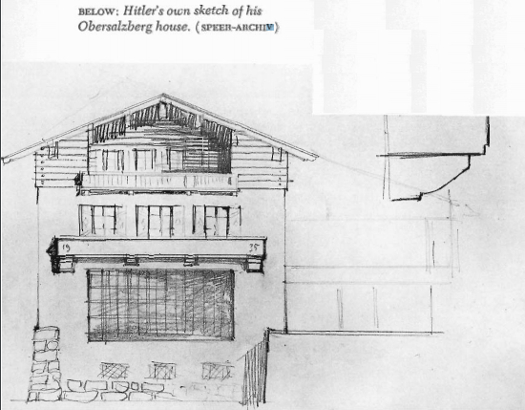 'Hitler's' sketch of Wachenfeld House. In Price nr. 618. (...) Hitler did not just sketch the plans for the Berghof. He borrowed drawing board, T-square, and other implements from me to draw the ground plan, renderings, and cross sections of his building to scale, refusing any help with the matter. There were only two other designs on which Hitler expended the personal care that he applied to his Obersalzberg house: that of the new Reich war flag and his own standard as Chief of State." Speer, page 98: "Sometimes Hitler sketched one of the towers of the historic fortifications of Linz. "Here was my favorite playground. I was a poor pupil in school, but I was the leader of our pranks. Someday I am going to have this tower made into a large youth hostel, in memory of those days." * Hitler himself had done sketches for all these structures." Comment: a number of these Linz sketches are depicted in Price, nrs. 673-675, 679-681, 689-692, 698, 700-703, 710-711, 714-722. Presumably these are all forgeries made by Speer. Speer, page 115: "Hitlers honors to me increased. (...) With a few shy words [he] gave me one of the watercolors he had done in his youth. A Gothic church done in 1909, it is executed in an extremely precise, patient, and pedantic style. No personal impulses can be felt in it; not a stroke has any verve. But it is not only the brush strokes that lack all character; by its choice of subject, the flat colors, the conventional perspective, the picture seems a candid witness to this early period of Hitler. All his watercolors from the same time have this quality, and even the watercolors done while he was an orderly in the First World War lack distinctiveness. The transformation in Hitlers personality, the growth of self-assurance, came later. It is evident in the two pen sketches for the great hall in Berlin and for the triumphal arch, which he drew about 1925. Ten years later he would often sketch with a vigorous hand, using red and blue pencil, sometimes going over and over his drawing until he had forced his way through to the con- ception he had dimly in mind. Nevertheless he still thought well enough of the modest watercolors of his youth to give them away occasionally as a special distinction." Comment: As far as is known, Hitler painted watercolors in 1906-1907 and in 1910-1917. Speer might be mistaken about the date, or was trying to authentice a forged Hiler watercolor in this way. 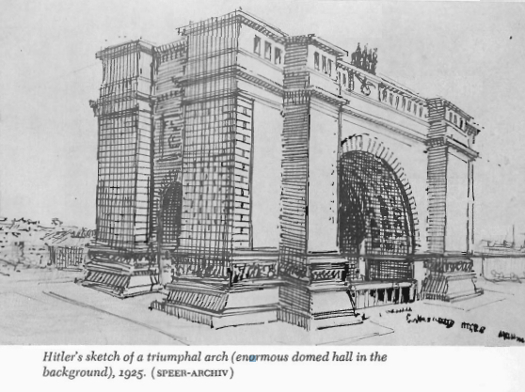 Speer, blz 135: "the arch was the classic example of the architectural fantasies he had worked out in his lost sketchbook of the twenties." Speer, page 139: " The Victory Column, while it would break the line of our projected avenue, was also not to be razed. Hitler regarded it as a monument of German history. In fact, he was going to make the column more impressive by adding a tambour to increase its height. He drew a sketch of the improvement; the drawing has been preserved." Comment: Depicted in Price, nr. 670. This sketch is clearly the work of a skilled architect / architectural drawer - not of Hitler. Speer, page 143: "In conferring with me over plans, Hitler perpetually drew sketches of his own. They were casually tossed off but accurate in perspective; he drew outlines, cross sections, and renderings to scale. An architect could not have done better. Some mornings he would show me a well-executed sketch he had prepared overnight, but most of his drawings were done in a few hasty strokes during our discussions. I kept these quick sketches of Hitler's, noting their dates and subjects, and have preserved them to this day. It is interesting that of a total of one hundred and twenty-five such drawings, a good fourth of them relate to the Linz building project, which was always closest to his heart. Equally frequent are sketches for theaters. One morning he surprised me with a neatly drawn design for a commemorative shaft for Munich, which was to be a new symbol of the city dwarfing the towers of the Frauenkirche. He regarded this project, like the Berlin triumphal arch, as his very own, and did not hesitate to make revisions, based on his own sketch, in the design of a Munich architect. Even today these changes strike me as real improvements, providing better for the transition between the static elements of the base and the dynamic thrust of the column." Comment: Speer sold these sketches on auctions in the 1970's. As provenance he mentioned: Hitler's sketchbook. Which is strange, as he wrote in his memoirs that this sketchbook was lost. Speer, page 152: "The buildings which were intended to frame the future Adolf Hitler Platz lay in the shadow of the great domed hall. But as if Hitler wanted by architecture alone to denigrate the whole process of popular representation, the hall had a volume fifty times greater than the proposed Reichstag building. He had asked me to work out the designs for this hall as early as the summer of 1936. 2 On April 20, 1937, his birthday, I gave him the renderings, ground plans, cross sections, and a first model of the building. He was delighted and only quarreled with my having signed the plans: "Developed on the basis of the Fuehrer's ideas." I was the architect, he said, and my contribution to this building must be given greater credit than his sketch of the idea dating from 1925. (...) This structure, the greatest assembly hall in the world ever conceived up to that time, consisted of one vast hall that could hold between one hundred fifty and one hundred eighty thousand persons standing. " Speer, page 352: "Hitler planned these defensive installations down to the smallest details. He even designed the various types of bunkers and pillboxes, usually in the hours of the night. The designs were only sketches, but they were executed with precision. Never sparing in self-praise, he often remarked that his designs ideally met all the requirements of a frontline soldier. They were adopted almost without revision by the general of the Corps of Engineers." Chapter 11, note 2: "Working sketches for the project, drawn up at the time, are still in existence. On November 5, 1936, Hitler did the sketches based on the preliminary plans I had presented." Chapter 11, note 8: "Hitler drew sketches for this building on November 5, 1936, in December 1937, and in March 1940." Albert Speer. Inside the Third Reich. Memoirs. Translated from the German by Richard and Clara Winston. Introduction by Eugene Davidson. The Macmillan Company, 1970. Ben Knapen. Albert Speer kwam nooit met excuses over nazi-verleden. NRC Handelsblad, 02-09-1981. Paul. L. Montgomery /iUPI - Albert Speer dies at 76; close associate of Hitler. New York Times, 02-09-1981. Robert Hughes. Of gods and monsters. The Guardian, 01-02-2003. Kate Connolly. Letter proves Speer knew of Holocaust plan. The Guardian, 13-03-2007. Gilbert King. The candor and lies of Nazi officer Albert Speer. Smithsonian.com, 08-01-2013. Lilian Visser. Albert Speer, Hitler's huisarchitect. Historiek, 22-03-2016. Albert Speer. German architect and nazi official. Encyclopedia Britannica, 10-26-2017. Ben Verzet. Architect en Minister van Defensie. Albert Speer. De Dokwerker, [gezien 12-01-2018]. [*]: TV-documentary 'Albert Speer: The Nazi who said Sorry'. Produced and directed by Martin Davidson. BBC, 1996/ UKTV History, ' 2.34-2.58. Ook interviews met Speer zelf, Joachim Fest, Erich Goldhagen, Gitta Sereny, Simon Wiesenthal. Magnus Brechtken. Albert Speer. Eine Deutsche Karriere. Siedler Verlag, 2017.